Join in as the world descends on the sleepy Hertfordshire village of Leavesden, just outside of Watford in 2019. Based at the Studios where all eight of the Harry Potter films were made. The Harry Potter Studio Tour packages give ordinary Muggles like you and me the chance to step into the enchanted world of Harry Potter. 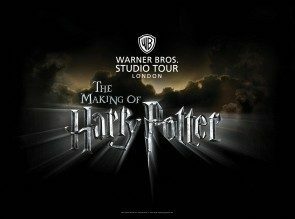 Click Here to Book: overnight Warner Brother’s studio tour package with hotel to see the Making of Harry Potter. Book the Making of Harry Potter studio tour at Warner Bros. Studio near London – a memorable highlight to a short break or holiday treat. This brilliant studio tour takes you behind-the-scenes of the Harry Potter Films and features the authentic sets, costumes and props. It also includes the animatronics and special effects that are normally closely guarded secrets of the film world. Can’t wait? You need to get booking. You can’t just turn up, you have to book in advance. So why don’t you book nearby accommodation at the same time and make it a short break or holiday treat. So what do you get to see on the tour? The stunning 1:24 scale model of the Hogwarts castle, which was used for aerial shots. NEW: a permanent addition allowing visitors to walk through the wizarding bank of Gringotts, the Lestrange vault, a gallery of goblins and so much more. Our packages include the studio tour and overnight accommodation (including breakfast) in a 3 star hotel or better for all four of you. We have managed to secure some great availability but, if booking on line you do need to book at least 10 days in advance. Otherwise call our Reservations team on +44 (0)1904 420452. A good example is the Holiday Inn Express by Watford Junction. Just 2 miles away from the Studio it is very handy AND also offers great access into London if you would like to spend some time there during your break… visit Madame Tussauds, The Tower of London or even take in a show for a London Theatre Break. If you don’t want to take the kids and you want a longer break, how about the four star Hilton Watford where a 3-day break with tour tickets costs from ONLY £154 per person*. The hotel is just outside town and offers the perfect base for business, leisure and pre-flight stopovers. With excellent access to the M1, M25 and Watford Train Station, it is only 15 minutes from the hotel to central London. It is also perfect if you want to catch a premier league football match at Watford FC. 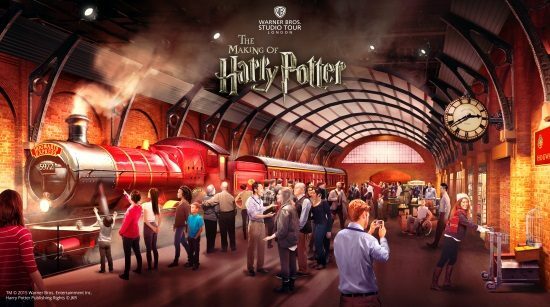 Highlights at Warner Brothers Studio Tour London include the original Hogwarts Express steam engine, including a recreated station platform, Platform 9 ¾, as part of our Harry Potter Studio tour packages. You can also enter the Great Hall, Diagon Alley and the eerie Forbidden Forest. 2019 also sees a new permanant exhibition under the towering marble pillars of the grand banking hall of Gringotts Wizarding Bank. The Making of Harry Potter is part of Good To See’s “Come to the match, stay for the weekend” promotion. Obviously the studios are not the only place to visit to walk in Harry’s footsteps. If you want to find out more Theatre Breaks would heartily recommend Harry Potter Places. It’s got so much information and we love the Supplementums – great detail! Thanks for the reviews that we have received – do feel free to send us more: we are always keen to hear what you have to say. My cousin and I enjoyed the whole experience. We stayed at the Holiday Inn. It was clean, service and food were excellant. The Harry Potter Studio tour was out of this world!! Exceeded our expectations! Would definitely recommend. I booked on to the Harry Potter Tour, because I could not get my prefered date, direct, at short notice. I'm so pleased I did, an all round great experience, from first contact, to booking, to the day of the tour. Our hotel was perfectly located in the heart of London, clean, well staffed, and newly refurbished. We had an excellent break away. The hotel was lovely, staff were polite and courteous and the breakfast was delicious. The tour itself was very good. I would have preferred an earlier entry time as there was so much to see and it took us almost 4 hours to get around it all. All in all a very good break away with the family.